Paul Lewis, FAIA, and principal and co-founder of New York’s Lewis.Tsurumaki.Lewis (LTL Architects), has succeeded Billie Tsien to become the Architectural League of New York’s 62nd President. Tatiana Bilbao and photographer Kris Graves were also elected to join the League’s board. 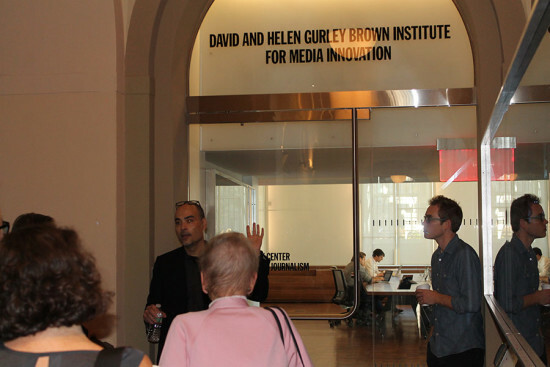 At the League’s 137th annual meeting on June 27 at the Cooper Union's Arthur A. Houghton Jr. Gallery, members voted to elect Lewis president and replace outgoing President Tsien, who had served from 2014 through 2018; Tsien will stay on the League’s Board of Directors. Bilbao has been elevated to a member of the League’s Class of 2021, and Graves has become the new Vice-President for Photography. At the annual meeting, League executive director Rosalie Genevro spoke on Tsien’s lasting contributions to the organization, explicitly her “manifold generosity, generosity that extends from deep interest in and enthusiasm for the work presented by the League’s myriad competition winners, lecturers, writers, and photographers, to willingness to use any and all contacts she may have on behalf of the League, to unstinting commitment of time to League affairs, to open-handed financial support—and readiness to encourage others to be supporters as well. “The last two years of Billie’s service have coincided, as we all know well, with a very fraught political climate. 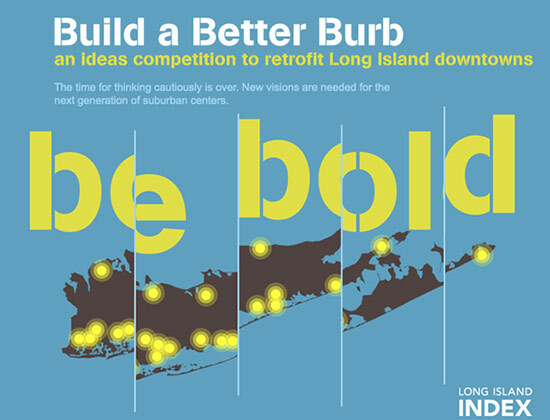 She has been clear about the importance of organizations such as the League standing strong as proponents of a pluralist, diverse, tolerant, compassionate society.” Lewis is no stranger to the Architectural League, having served on the nonprofit’s board since 2006 and as a frequent juror in the League’s competitions. LTL was selected as an Emerging Voices winner in 2002 and has gone on to finish both large academic projects, such as the revamp of Cornell University’s 160,000-square-foot Upson Hall, as well as speculative research initiatives. 2017 Best of Design Award for Adaptive Reuse: The Contemporary Austin, Jones Center Architect: Lewis.Tsurumaki.Lewis Architects Location: Austin, Texas Formed from the merging of Arthouse and the Austin Museum of Art, the Contemporary Austin is a 23,800-square-foot museum in the heart of Austin. The building presents a fresh identity for the new organization, while preserving and adding to the century-old building’s history of transformations from a theater, a department store, and a local art center to a highly refined exhibition space. The most public aspect of the renovation comprises a perforated aluminum canopy that floats 23 feet above the roof deck, providing shelter from the elements and framing site-specific art installations on the parapet. The canopy supports a retractable weather curtain, monumentally scaled at over 5,600 square feet. Key to the renovations, though less visible by design, are alterations that provide increased capacity for large-scale artworks and exhibitions, including enlarged access panels, a high-capacity scissor lift, environmental control upgrades, and improvements to the building envelope. "Simultaneously serious and whimsical, the project is a beacon not only for Austin, but for adaptive reuse in general—inspiring for its inventiveness." —Eric Bunge, Principal, nARCHITECTS (juror) Construction Manager: Zapalac/Reed Construction Company MEP Engineer: Kent Consulting Engineers Structural Engineer: MJ Structures Lighting Designer: Lumen Architecture Curtain Fabricator: Contract Workroom Honorable Mentions Project: New Lab at the Brooklyn Navy Yard Firm: Marvel Architects Location: Brooklyn, New York The New Lab transforms Building 128 at the Brooklyn Navy Yard, once a shipbuilding factory, into a high-tech design and prototyping center. A variety of classes and educational programs will provide job training for Navy Yard tenants and other high-tech manufacturers, as well as local entrepreneurs wishing to advance their skills. Honorable Mention Project: Massachusetts Museum of Contemporary Art (MASS MoCA), The Robert W. Wilson Building Architect: Bruner/Cott Architects Place: North Adams, Massachusetts Mass MoCA breathes new life into a 17-acre industrial complex built in the late 1800s with this pioneering adaptive reuse project. The museum was completed in three phases, with the Robert W. Wilson Building being MASS MoCA’s final realization of its “museums within the museum” concept. 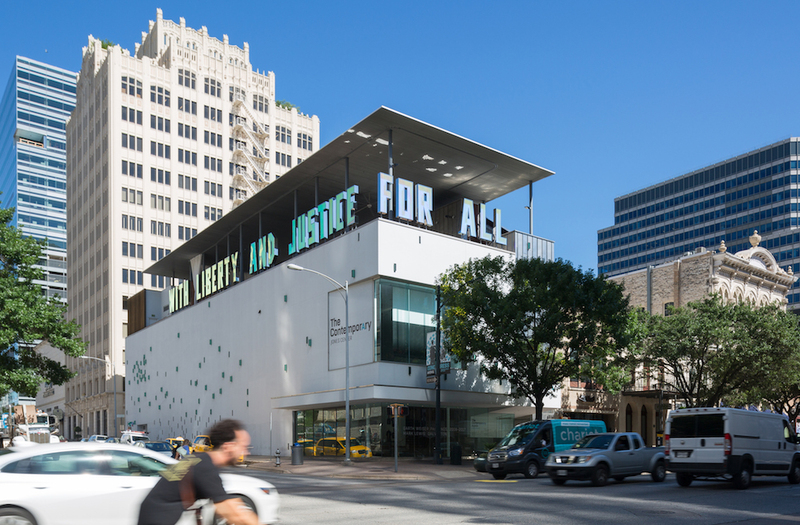 In December of last year, New York–based Lewis Tsurumaki Lewis Architects (LTL) completed its renovation of The Contemporary Austin-Jones Center which, among other improvements, includes the freshly inaugurated Moody Rooftop pavilion. The $3 million dollar renovation responds to the enormous growth of the institution and its popular public programming as well as the increasing scale of Austin’s architecture. This project is one in a series of designs that the organization has commissioned in recent years including the ongoing master planning of its sculpture park at Laguna Gloria by Cambridge, Massachusetts–based landscape architecture firm Reed-Hilderbrand. Since the museum opened its downtown location in 2010, the roof deck has been a central feature of its public engagement strategy and often hosts outdoor film screenings and music performances. This upgrade allows The Contemporary to hold larger events with more control over the open air roof space. LTL designed a deceptively thin roof canopy that hovers 23 feet above the original structure with stark white curtains that can be drawn to enclose the space for year-round use. The museum also moved its administrative office to Laguna Gloria, thereby allowing for Jones Center to double its ground floor area for exhibitions and upgrade its mechanical systems to accommodate a more diverse range of art installations. The building is situated along Congress Avenue, Austin's central thoroughfare, with a direct view to the State Capitol, making the museum one of the city’s most visible cultural institutions. Coincidental with the re-opening of the museum was the installation of a text artwork by artist Jim Hodges that wraps the edge of the roof. The piece consists of 27 seven-foot-tall block letters reading “With Liberty and Justice for All” lit from behind and encased with iridescent mirrored surfaces. 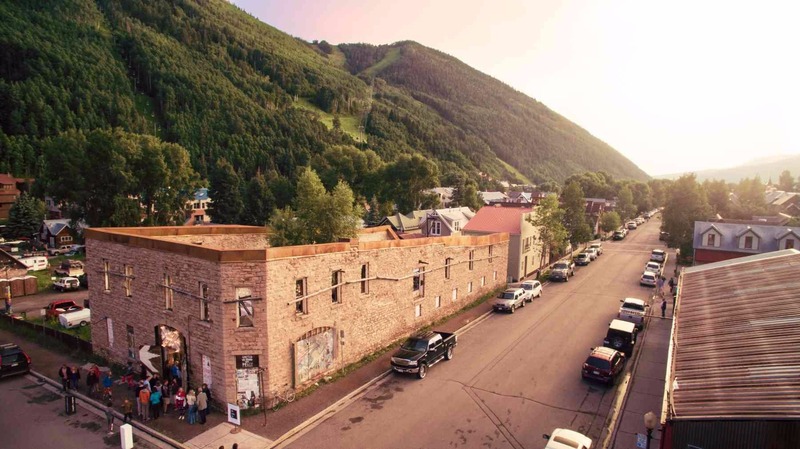 The eponymously titled piece is in the public gaze at all times and will reportedly remain in place for three years, though the architect re-designed the roof to potentially mount the letters permanently. 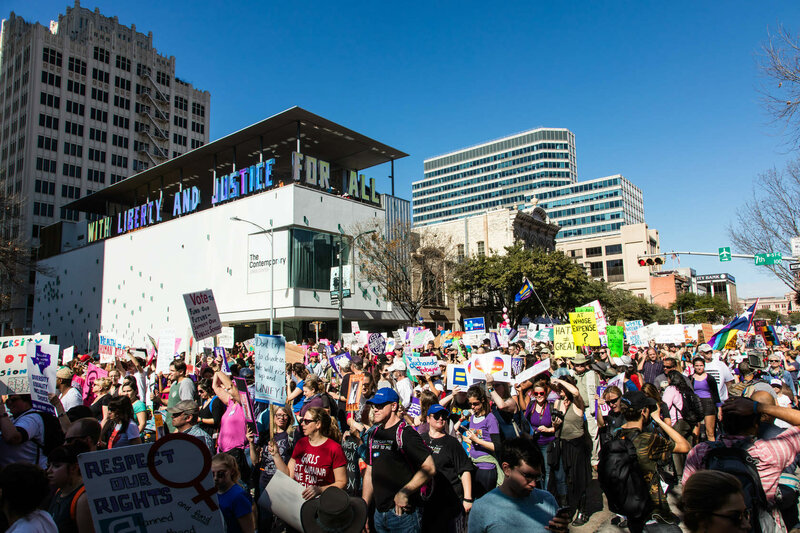 Earlier this year, directly following the presidential inauguration, both the building and the art were the backdrop for the Women’s March in Austin, underscoring the social responsibility that cultural institutions have to shape a city’s identity. With cooperation between distinctive architectural design and timely public artwork, the museum aims to vault itself from a sometimes scrappy nonprofit to a growing powerhouse among national art institutions.